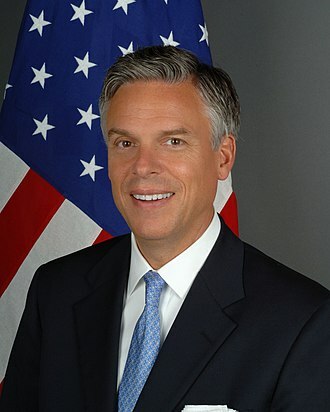 Birth Name: Jon Meade Huntsman, Jr.
Jon Huntsman is an American politician, diplomat, and businessperson. A Republican, he has been U.S. Ambassador to Russia, since October 3, 2017. He was previously U.S. Ambassador to Singapore, from August 11, 1992 to June 15, 1993, Governor of Utah, from January 3, 2005 to August 11, 2009, and U.S. Ambassador to China, from August 11, 2009 to April 30, 2011. He was a candidate for the Republican Party’s nomination for President of the United States in 2012. Jon is the son of Karen Christina (Haight) and Jon Huntsman, Sr. (Jon Meade Huntsman), a billionaire businessman and philanthropist, who founded the Huntsman Chemical Corporation. Jon is married to Mary Kaye (Cooper) Huntsman, an activist. Among their seven children is television personality Abby Huntsman. Jon has English, some Scottish, 1/8th Norwegian, 1/8th Swedish, 1/16th Danish, distant Dutch, and remote French Huguenot, ancestry. Jon is a third half-cousin, once removed, of politician Mitt Romney. Jon’s paternal great-great-great-grandfather, early LDS leader Parley Parker Pratt, was also Mitt’s paternal great-great-grandfather. Jon is a member of the LDS (Mormon) faith. Jon’s paternal grandfather was Alonzo Blaine Huntsman (the son of Gabriel Alonzo Huntsman and Nellie Dean Melville). Jon’s grandfather Alonzo was born in Utah. Gabriel was the son of Gabriel Riley Huntsman and Hannah Hanson, whose parents were Danish. Nellie was the daughter of Daniel Dutson Melville, whose parents were Scottish and English, and of Emma Dean McBride. Jon’s paternal grandmother was Sarah Kathleen Robison (the daughter of Joseph Alfred Robison and Mary Elizabeth/Mattie Keith). Sarah was born in Utah. Joseph was the son of Franklin Alonzo Robison and Isabella Eleanor Marden Pratt. Mary Elizabeth was the daughter of James Allen Keith and Sarah Velda/Velia Ball. Jon’s maternal grandfather was David B. Haight (David Bruce Haight, the son of Hector Caleb Haight and Clara Josephine Tuttle). Jon’s grandfather David was born in Idaho, and was a member of the Quorum of the Twelve Apostles of the LDS church. Hector was the son of Horton David Haight and Louisa Leavitt. Clara was the daughter of Norton Ray Tuttle and Helen/Hellen Elizabeth Utley. Through his Haight line, Jon is a fourth cousin, once removed, of musician Nikki Six. Jon’s maternal great-great-great-great-grandparents, Caleb Haight and Keturah Horton, were also Nikki’s three times maternal great-grandparents. Jon’s maternal grandmother was Ruby Mildred Olson (the daughter of Pehr Olofsson/Olson and Christena Maria Larsen). Ruby was born in Utah. Pehr was born in Ofratop, Kvistbro, Sweden, the son of Olof Olofsson and Stina Lotta Persson. Christena was born in Utah, to Norwegian parents, Lars Larsen and Marine/Maren Oline Olsen.